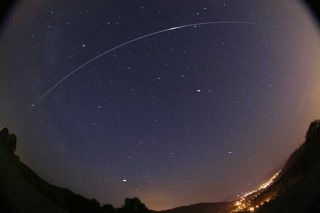 An ISS flare photographed as the space station passed over the town Nydek in the Czech Republic. Skywatchers have one last chance to see two crewed spaceships sail across the night sky in 2011 tonight (Dec. 22) as a Russian spacecraft closes in on the International Space Station, NASA officials say. The Russian-built Soyuz space capsule launched into orbit on Wednesday (Dec. 21) carrying three new crewmembers for the space station. This is the final manned spaceflight of 2011, so tonight is the last opportunity of the year to see multiple crewed spacecraft in action. The Soyuz is ferrying NASA astronuat Don Pettit, Russian cosmonaut Oleg Kononenko and Dutch astronaut Andre Kuipers to the space station, where they will join three other crewmembers already aboard. "Pettit, Kononenko and Kuipers are scheduled to dock to the Rassvet module of the station at [10:22 a.m. EST] Friday, Dec. 23," NASA officials wrote in an update to the agency's skywatching website. "Sightings of their Soyuz vehicle before docking may be possible over your area." The International Space Station is the largest artificial structure in space. It is the size of a football field and can easily be seen from the ground, even without a telescope. The space station, which was completed earlier this year, appears as a bright moving star that can rival the planet Venus in brightness. Russia's Soyuz spacecraft are much smaller than the space station, but can also appear as a moving light across the night sky. The Soyuz is chasing the space station, so both spacecraft can be seen in succession by skywatchers who have clear weather and know where — and when — to look. Each website will ask for your zip code or city, then provide a list of suggested spacecraft-spotting times. Predictions computed a few days ahead of time are usually accurate within a few minutes. But be warned: These predictions can change due to the slow decay of the space station's orbit and periodic re-boosts to higher altitudes. So check frequently for updates. Another great site is this one, which provides real-time satellite tracking. The website shows you where over the Earth the space station happens to be at any given moment during the day or night. The two spacecraft aren't the only sky show to try and catch tonight. The annual Ursid meteor shower peaks tonight and could be better than average since the moon is in its dark "new" phase and won't interfere. Several planets of the solar system, including Venus, Jupiter and Mars, are also visible in the sky this week in an extra cosmic treat. If you snap a photo of the Soyuz and space station flying in tandem and would like to share the image with SPACE.com, please contact Managing Editor Tariq Malik at: tmalik@space.com.